Confusing Words: Which Is Correct? Do we give aid or aide? Do we accept defeat or except defeat? These word pairs can confuse even adults! 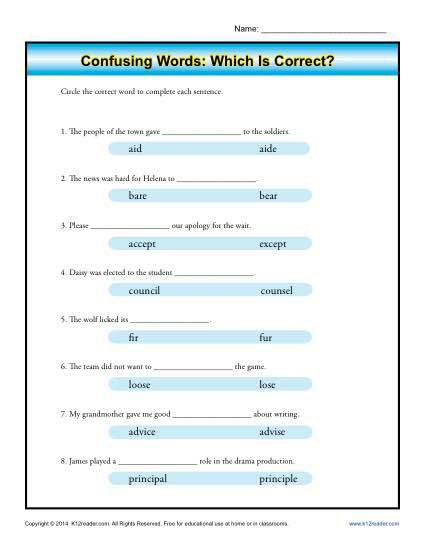 This worksheet asks your student to pick the correct word to complete the sentence. Students practice with these word pairs: aid/aide, bare/bear, accept/except, council/counsel, fir/fur, loose/lose, advice/advise, and principal/principle. Whether as a vocabulary drill or as practice for Common Core Standards for 4th, 5th, or 6th grade Language, it’s sure to please!